Accepted in Physical Chemistry Chemical Physics. Quite possibly the hardest-fought article within the peer review process I’ve found myself on the revision-side of, with an interesting debate between we authors and two crystallography reviewers occurring over three total revisions (and, it should be noted, two of the three original reviewers accepted the article without any revision, so this really was a debate between we authors and the crystallography reviewers). To briefly summarize (as the content of the controversy is part of ongoing work), the paper includes an inelastic neutron scattering (INS) spectrum at 25 K, a new X-ray diffraction study at 90 K, and 77 K and 293 K Raman spectra. The INS spectrum and 77 K Raman spectrum contain a feature at 450 cm-1 that does not occur at higher temperature and that is not predicted by the solid-state density functional theory simulation with the 90 K structure. The proposed argument is that a proton is either shifted from an alanine -NH3+ group to a nitrate oxygen (which the crystallography reviewers generally refused to accept as a reasonable explanation) or the potential energy surface for this proton between the -NH3+ and nitrate oxygen is changed considerably due to contraction of the unit cell at low temperature (which our 90 K crystal structure does not show and so, if it occurs, must occur at lower temperature). The disagreement between ourselves and the crystallography reviewers concerns the use of the 90 K structure as a basis for proposing full proton motion from alanine to nitrate. 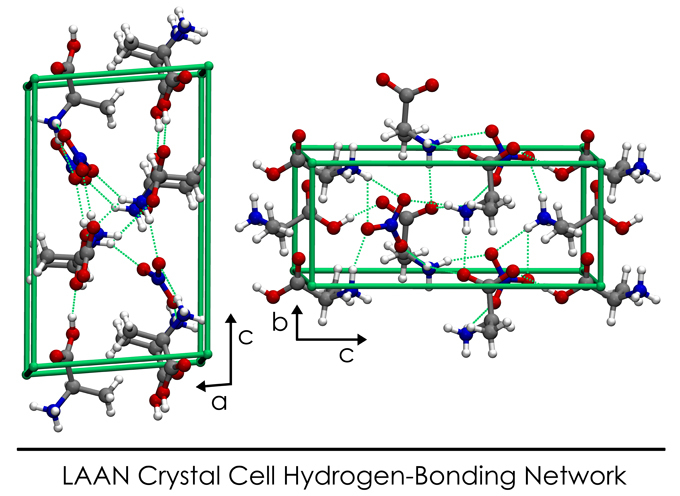 On the one hand, the 90 K structure solves with the protons on the alanine and so, to the extent that one can extrapolate from a single point, there is a notable absence of crystallographic data to confirm that proton motion is occurring. On the other hand, the spectroscopic change (new peak at 450 cm-1) is entirely consistent with the proposed proton motion to the nitrate OR the marked change in the shape of the potential well for the proton motion between the -NH3+ and nitrate oxygen. We expect this mystery to be solved with a very low temperature neutron diffraction study to determine exactly where the proton resides at 25 (or so) K.
Abstract: The 2:1 amino acid salt of L-alanine with nitric acid was crystallized and the vibrational spectrum measured at 25 K by incoherent inelastic neutron scattering (INS) spectroscopy. The spectrum was simulated using solid-state density functional theory based on a new 90 K structure determination. A feature observed at approximately 450 cm-1 in the experimental spectrum of L-alanine alaninium nitrate is noticeably absent in the calculation. Further investigation by Raman spectroscopy reveals spectral differences between the spectra at 77 and 293 K. The nature of these spectral changes and the disagreement between the INS spectrum and its simulation are discussed in relation to a possible structural change at low (< 90 K) temperature.